Beneath the streets of New New York, woven among the ruins of Old New York, lie an endless labyrinth of sewers. Home to the Sewer Mutants, the sewers are a bit more metropolitan than in the 20th century. The mutants who live there have built their own city. Aside from the smell, and the inability to see the sky, and the unusually large number of dry cleaners, it's not that different from any other city. Some claim that in the sub-sewers below NNY's sewers there lives a race of hideous sub-mutants, but most dismiss this as a sub-urban legend. 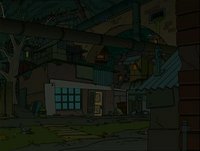 Places in the sewers include the Mutagenic Sewage Lake and Stenchy's Mutant Café, the latter one serving Sewer Burger with or without rat feces. Youngster Mutants seem to enjoy air boat races through the sewers. Description : The only known city in the sewers, and quite possibly the only one whatsoever. 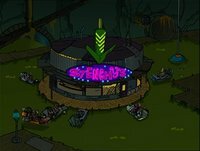 Description : A 50s-style diner located in the sewers. 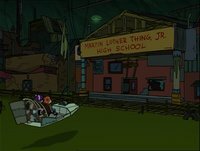 Description : One of the least-prestigous schools in all of New New York, MLT, Jr. High is the only public school in the sewers. Being a segregated school, all the staff and students are mutants. Description : A large lake of toxic, radioactive sluge. Contact with its tainted waters will instantly mutate any non-mutant DNA. 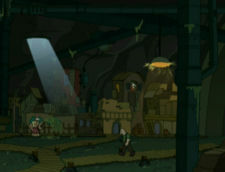 In the first appearance of the sewers, all of the buildings appear to be dry cleaning. 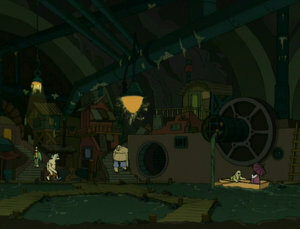 Businesses in the sewers include Bed, Bath and Beneath, Big Mutant Boy's, and Starbucks. This is where the Land Titanic sank after a wheel struck a mailbox. This page was last edited on 9 November 2015, at 21:21.